A house cleaning business is a highly flexible and profitable small business that you can start on a shoestring. You don't need any particular skills to become adept at this business. All you need is a willingness to show up and the urge to be of service and take pride in doing good work. Delivering excellent customer service helps you build repeat business, so you can control your own destiny and financial security. You may start a house cleaning service to help you navigate comfortably through a gap between 'real' jobs, which is a great idea, btw. We did it, and decided to stick with it for 10 years. Like us, many entrepreneurs discover that housecleaning is a dependable small business in its own right -- easy to operate, good-paying and reliable. There are perks. Many professional house cleaners thrive on the physical activity aspect of the business. It's a healthy, lucrative alternative to a conventional desk job. However, you can't simply pick up a sponge and expect your customers to appear out of the woodwork. You need expert guidance about getting started and immediately bringing in money. You need to spread the word, and you must be well-organized in order to start a business that pays well from the get-go. You may not know it, but the Internet can play a critical role in your business success. Therefore, having a professional online presence, such as an interactive Web site, can help you gain credibility and help people find your housecleaning service quickly and easily. 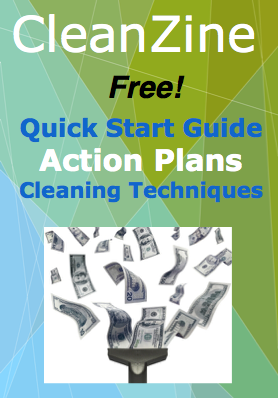 In closing, a house cleaning business is easy to start, fairly risk free if you use an established business marketing system and as profitable as you want it to be.